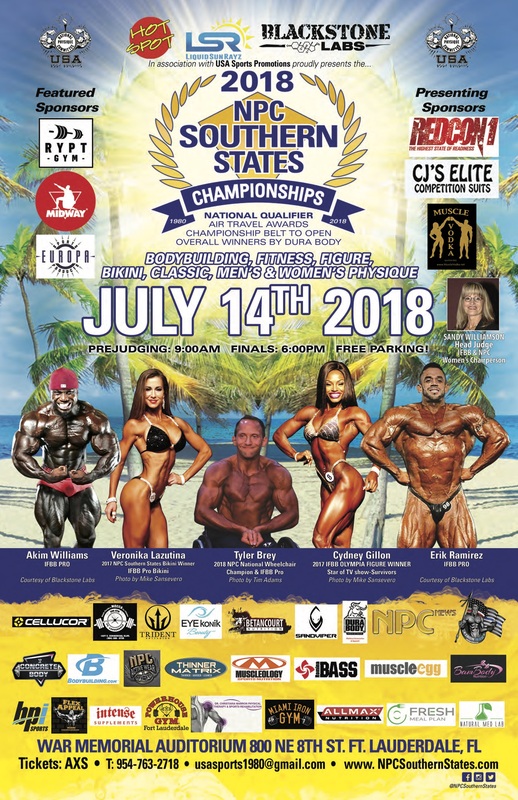 LAUDERDALE, Florida –Saturday July 14th fitness enthusiasts will celebrate the 38th Annual NPC Southern States Championships in South Florida. The fitness, figure, bikini, physique and bodybuilding championship gets underway at the War Memorial Auditorium, 800 NE 8th Street in Ft. Lauderdale, Florida. The NPC is a part of the Internal Federation of Body Builders (IFBB) Professional League. The 2018 NPC Southern States Championships ranks as one of the largest events East of the Mississippi. The contest caliber is high and proof is the fact that over 35 previous winners have become IFBB Pros. “We made plans for the most concise and energetic presentation in one day. Some of the finest amateur athletes in the U.S.in the sport of fitness,” said Peter W. Potter, president of the USA Sports Promotions, national NPC vice president and Promoter. “We will have over 25 IFBB Professionals present and over 30 exhibit booths (the largest we have ever had) presenting the very latest in nutrition, supplements, clothing and equipment.,” Potter explained. Women’s Chairperson IFBB and NPC Sandy Williamson, from Riverside CA., will be returning as the head judge and honored guest. Friday, July 13th at 6pm at the War Memorial Auditorium, there will be featured a free Super Seminar for all Women covering topics like contest preparation; NPC rules, judging, posing, and answering questions. The seminar leaders are Sandy Williamson and IFBB Pro Gennifer Strobo assisted by IFBB Bikini Pros Romina Basualdo and Angie Garcia. Saturday’s prejudging begins at 9 a.m. and the evening show is at 6 p.m. Ticket price for the prejudging/ general admission is $30; for the finals range from $30 -$50. Free parking is available all day. Tickets are available at AXS ( tel. 888-929-7849) and the War Memorial Auditorium (tel. 954-828-5380). For more information on the 2018 NPC Southern States Championships, visit npcsouthernstates.com. The contest is a NPC National qualifier and this year will be the 38th Anniversary of it being promoted by USA Sports Promotions of FL Inc.
Over 35 overall winners have become IFBB Pros. One of the most well known is 1994 winner Dexter Jackson, Mr. Olympia.